Milpitas, Calif., September 14, 2011 - JDSU today announced that it has led the development of a new communications test breakthrough for measuring the end user quality of experience when uploading and downloading video and other high-bandwidth content over the Internet. JDSU developed the test methodology, known as RFC 6349 , in collaboration with two major global network operators. It was recently published by the Internet Engineering Task Force (IETF), an organization dedicated to developing and promoting Internet standards, as a repeatable service activation test method for managed IP networks. • Customer satisfaction improved by providing deeper visibility into the application and TCP layer, enabling service providers to more precisely measure the network’s ability to reliably support video and other unpredictable, high-bandwidth traffic driven by social mediasites such as Facebook and YouTube. • Every major Ethernet service addressed, including Ethernet backhaul, Ethernet business services and cloud computing, simplifying the installation process. • Operating expenses reduced as field technicians install and test new services more efficiently, using the methodology to evaluate the TCP and application layer in less than five minutes. The TCP throughput test methodology is an important communications test industry milestone. Traditional installation methods, including RFC 2544, do not entirely verify the ability of the network to carry high - bandwidth application traffic since only the Ethernet and IP layers are tested. The newtest method helps avoid and reduce customer churn, and it allows service providers to experience the network as their customers do. 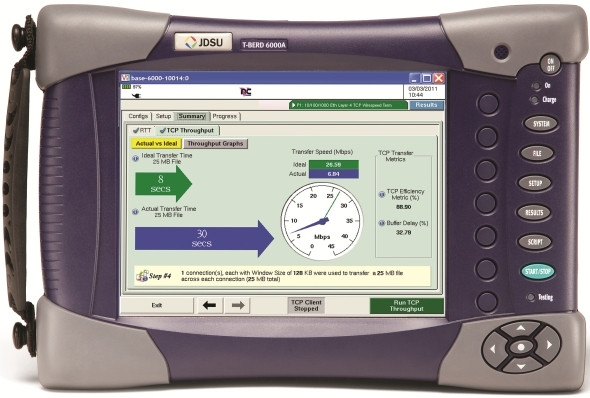 JDSU has integrated the methodology in its TrueSpeed™ automated TCP test solution, available for the JDSU Multi-Services Application Module (MSAM) on both the JDSUT-BERD/MTS-6000A and JDSU T-BERD/MTS-8000. Major communications providers have successfully used JDSU TrueSpeed to validate TCP layer performance for their end customers. For more information visit: www.jdsu.com/go/rfc6349. “JDSU has along history of communications test innovation and we are proud to lead the development of another industry breakthrough that promises to deliver important benefits to our customers worldwide,” said Jerry Gentile, senior vice president in JDSU’s Communications Test and Measurement business segment.